Here’s one of those odd crazes that you’d probably forgotten about until now – I certainly had, and I’m not even sure quite why they popped back into my head. 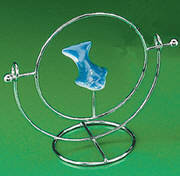 In the early Eighties (or it might have been late Seventies) there was a fad for these funny little metal balancing ornaments. I’m not sure if there was a “proper” or official make of these ornaments, but there were certainly a great many cheap knock offs available, especially in knock down price gift shops, the kind which are usually dotted around in plentiful supply in most good old British seaside towns. The ornaments were made from lengths of silver coloured metal rod (possibly aluminium but I suspect more likely steel) which were bent in different ways and soldered together. In certain key positions ball bearing like lumps had been soldered in order to move the rods centre of gravity to a different place. This was so that the carefully bent shape could then be balanced on another piece of metal in a manner which initially seemed to defy gravity. You know how sometimes there were certain toys which no matter how many times you added them to your Christmas List, Father Christmas (he was still Father Christmas when I was a kid, not Santa Claus as he seems to be called these days) never seemed to bring them? One such toy for me was Screwball Scramble, which I must have asked for several years running. Sadly I never got one of my own, and had to be content with playing on the ones they sometimes put out in the shops in the run up to Christmas. 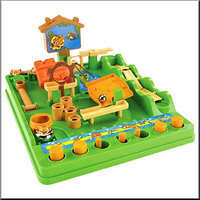 Screwball Scramble was an obstacle course for ball bearings, the aim being to get your ball bearing from the start of the course to the end as quickly as possible. 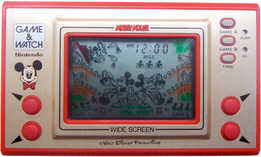 You controlled the game via a series of buttons and switches at the front of the maze which were all mechanical in nature – no batteries required here. Stabbing the buttons and flicking the switches caused various parts of the obstacle course to be activated, so with careful timing and a modicum of good luck you could move your ball bearing about without actually touching it. That is assuming the ball didn’t jump off completely and you had to replace it! I was a little stuck for a survey this week, so I decided to get some inspiration by visiting a few random pages on this site using the new(ish) random post feature that I added a few weeks back. If you haven’t spotted it yet (I probably ought to make it a bit more prominent!) it’s at the bottom of every posts individual page, and also at the very bottom of any page with multiple posts (e.g. the main page). Anyway, I clicked this a few times and up came the entry for the classic old kids lunchtime show Rainbow, so that’s what this weeks survey is about. I want to know which of the puppet characters was your favourite. For the sake of argument I’m including Bungle loosely as a puppet even though he was a bloke in a bear suit, but I refuse to include Geoffrey, Rod, Jane or even Freddy (even though they were a bit wooden at times – ho ho!). Was it George the effeminate pink hippo (he was a boy apparently), Bungle the aforementioned bloke in a bear suit (who definitely deserved his nickname Bungle Bonce) or Zippy the yellow, er, thing with a zip for a mouth? Who was your favourite Rainbow character? 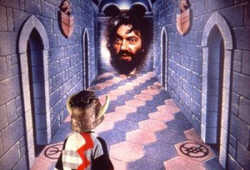 Knightmare was a children’s TV game show aired on ITV from 1987 to 1994. As the name may suggest, it had a fantasy setting and involved a group of four adventurers going on a quest through Knightmare Castle, which was overseen by Treguard of Dunshelm (played brilliantly by Hugo Myatt). Treguard was basically the host of the show, who provided help and advice to the adventurers, although quite often the kids took little notice of him! The setting may sound like an excuse for poorly made cardboard scenery and badly painted polystyrene rocks but the fact was that Knightmare was quite technically advanced for its time, making use of chromakey (or blue screen effects – for some reason blue was used back then, these days its green!) to superimpose computer generated background images behind the adventurers. This may have looked good for the viewers, but obviously all the contestants on the show could see was a big blue room. This was solved by having just a single contestant wandering around the castle with a massive helmet on their head which stopped them from being able to see anything. The remaining three contestants sat watching their friend on a screen and could give them instructions on what to do, such as walk forward, turn left or pick up an item. 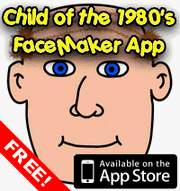 TV Quiz Shows – Better or Worse in the Eighties? Today’s TV quiz and game shows seem to be concerned with glitz and big money prizes, but is this necessarily a Good Thing? You might be able to win a million pounds now for answering a handful of pub quiz questions but do you find these shows as entertaining to watch now as those from your youth? The Eighties saw a great many classic game shows air, and on many you counted yourself lucky if you walked away with just a Blankety Blank silver cheque book and pen, a new dustbin or a tankard, Bendy Bully and a set of Bullseye darts. The star prize on many shows back then was either a holiday or a new car, or curiously on Bullseye a speedboat for some reason. Today so many quiz shows seem to artificially add suspense to the proceedings by adding infuriating delaying tactics. How many times have you sat watching Who Wants To Be A Millionaire and started shouting at Chris Tarrant to get on with it? So what do you think? Which era of TV quiz shows is best? The “super smashing great” Eighties, or the “is that your final answer” Noughties? 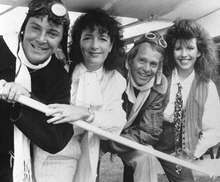 Were TV Quiz Shows better in the Eighties than they are now? Patrick Swayze, star of films such as Dirty Dancing and Ghost, has passed away on September 14th 2009, aged 57. He was diagnosed with pancreatic cancer in January 2008, but despite chemotherapy the cancer spread to his liver and was therefore the cause of his death. Swayze was born in Houston, Texas in 1952, the son of an engineering draftsman father and a choreographer mother. His mother was obviously a big influence on him as he enjoyed ballet and acting from a young age, eventually attending the Harkness Ballet and Joffrey ballet schools in New York. His first job was as a dancer in the Walt Disney parades, but before long he was standing in as a replacement for the role of Danny in the Broadway production of Grease. His big break came in 1985 when he starred in the American Civil War mini series North and South, which he followed up with the seminal Dirty Dancing, playing the role of dance instructor Johnny Castle. Ironically this film was initially intended to have a brief theatrical release and then go straight to video, but it instead became a mega success, earning hundreds of millions of dollars and was the first film to sell a million copies on videotape!